The process of singing is viewed holistically and encourages a natural opening and balancing of the voice. Singers are gently invited to move with joy and confidence in discovering their own voices through engagement and group participation. ‘Uncovering the Voice’ has been described as yoga for the voice. 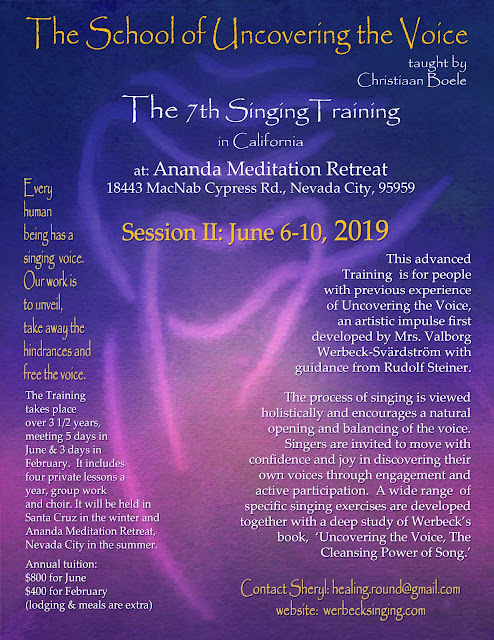 The wide range of singing exercises developed by Valborg Werbeck-Svardstrom are innately therapeutic and bring balance to the whole person on multiple levels. All singers are welcome, from complete beginners to advanced musicians. Everyone’s abilities will grow together in community. Shayndel Adler is a certified teacher of Uncovering the Voice, an ordained cantor (Hebrew prayer & ritual leader), a Waldorf Teacher and a Holistic Health Practitioner. She has been studying Uncovering the Voice since 2001. 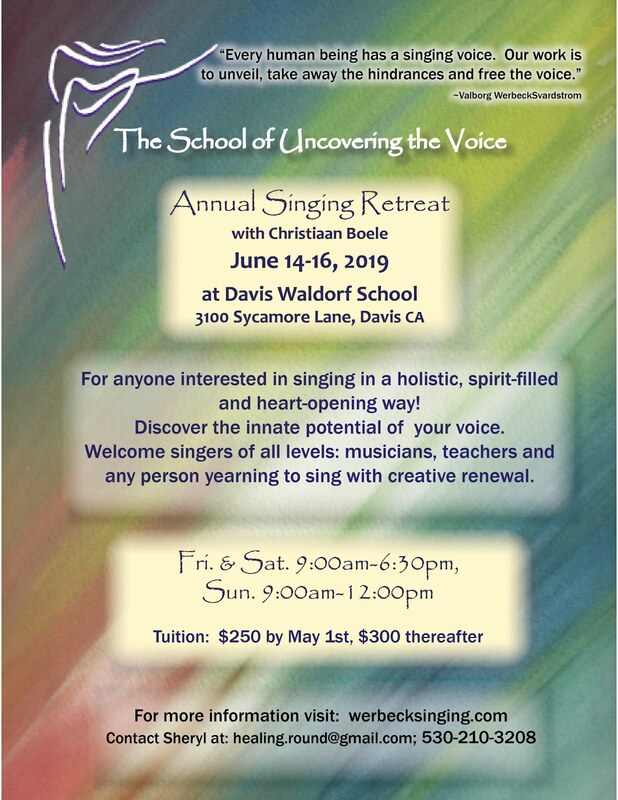 ~For those of you interested in the Advanced Training with Christiaan Boele, June 2019: This series of classes provides the prerequisite of 'prior experience of uncovering the voice' to be considered for admittance into the Training. Eurythmy: Movements and gestures that reveal to the eye what language and music bring to the ear. Speak and sing with the human body, making speech and music visible. School Group: If three or more staff members from a school or a choir attend, each participant receives $50 off of their tuition. Past Open Singing Course Participants: that register with a guest new to the Open Course will receive $50 off of their tuition. Werbeck singing lessons are available with Sheryl Adler-Eldridge in Davis, CA and also via skype. Singing is a primal human urge, with the potential for the expression of the core of our being. Song has accompanied life through the eras of human culture. It holds its ever important place in cultural activities, rituals, and religious ceremonies, as well as through the work and play of everyday life. As a testimonial to this, we find folksongs fitted to the passing of the seasons, festivals, holidays, professions, and almost every other area of life, all across the world. Today, it is becoming increasingly difficult to find, and develop our most precious and personal instrument, the voice. The School of Uncovering the Voice comes as a timely path to discovery and expression of the individual identity in each voice. From a range of highly differentiated exercises, the healing and regenerative powers of the voice are set free. Through this process, singing comes to hold more than ever the potential for expression of the innermost core of personality. It is a path to encounter oneself, and tune to inner harmony.